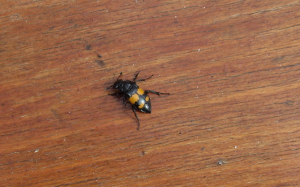 Observation - Sexton Beetle - UK and Ireland. Description: Not too sure but it seems the best fit he descriptions. It was in the conservatory near dead flies! Not too sure but it seems the best fit he descriptions. It was in the conservatory near dead flies!